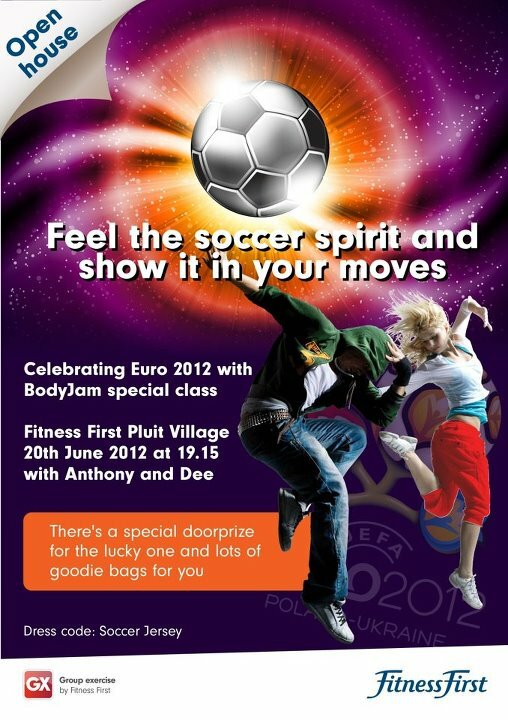 Fitness First Pluit Village (FFPV) & Pluit Village held an special event with a special theme, EURO 2012. 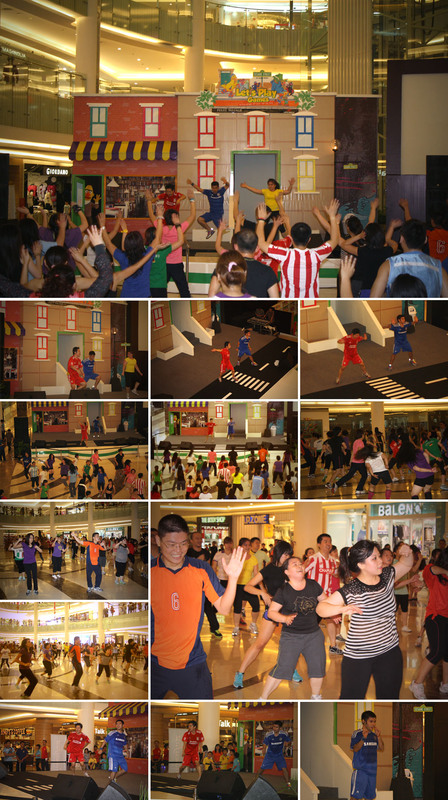 The show will be held in the main atrium.The FFPV’s GXM, Aurelia Lynda, chose Bodyjam class as the main program. The instructors are Anthony Kesuma and me. I’m so excited !! EURO 2012 fever! There will be a dresscode for us, the staffs and the members, THE SOCCER JERSEY. The event date is 20 June 2012, 7.15 pm. The event is open house, everyone can join! The day has come, when I reached there, Pluit Village also held its special event, “LET’S PLAY GAMES” with Sesame Street as the theme. I went to the main atrium, Ahh I love the stage!! It’s big, It’s wide, It’s cute. I love the dance floor, soooo spacioouusss!! PERFECTO!! Then I went to the Fitness First, Yes! 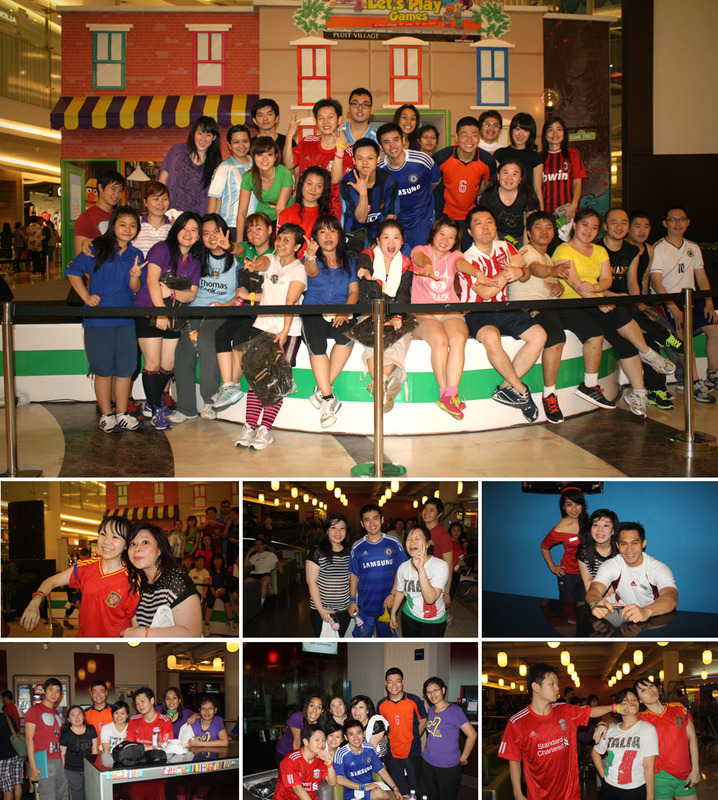 This club always amazing, I love the decorations and all the staffs are wearing the soccer jersey. Cohesive! Anthony and I seem like a young boy wearing the soccer jersey, a little bit too big, but I think we’re cute, ha ha ha! Some members also wear the soccer jersey, the other try to mix and match their costume with long socks and short pants, they’re all looking good! 7.00 pm !! Let’s go to the dance floor!! We’re so excited.. marching to the main atrium together. Start preparing the sound, music and mic. I will teach the 1st Block and Anthony will teach the 2nd Block. Let the show begin! Let’s dance! We start with the song: La Copa De La Vida (The Cup of Life) as the introduction/warm up to match the EURO 2012 theme, we dance with Angel and Lynda. Then we’re going to party! We chose the member’s most favorite track list, They’re so happy !! and sweaty…. A lot of people see us dance, some people enjoy the music, moving their body smoothly with the beat. I also can see some children try to dance with us, that’s really cute. The event is success! Lynda as the GXM proud and thanks us and the members. She also announced the next day will be a Bodycombat® class with Pippo and herself in here. There will be a great moment !! I’m so happy with this event, hopefully I’ll get the chance again in the future. The Show Is Not Over! Valentine’s Day is here !! A moment of love can be celebrate in various ways. 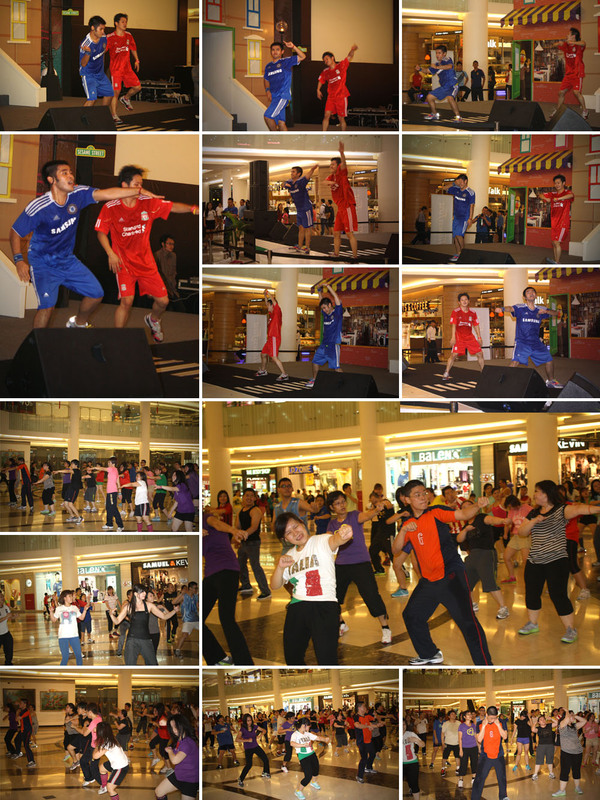 Fitness First Pluit Village (FFPV) held a special event “Valentine Party” for 2 days, 15th – 16th February 2012. Special classes will be presented by FFPV’s GX. The first day is Bodyjam™ vs Sh’bam® Extended 90 minutes and the next day are TRX & Muay Thai Challenge and Bodycombat™ Extended 90 minutes. Dresscode for this event is PINK. It’s gonna be fun. FFPV also decorated the club with lovely ornaments, mostly pink heart, but in some corners we can see lovebirds origami, cupids, pink balloons and a lovely pink fat piggy. The staffs and personal trainers were wearing pink outfits, they’re looking good! I’m gonna write about the first day event. Just like usual, before the class start. The members and friends were gathering to taking pictures. They joked and acted like lovers. All I can see is their happy smiling faces. 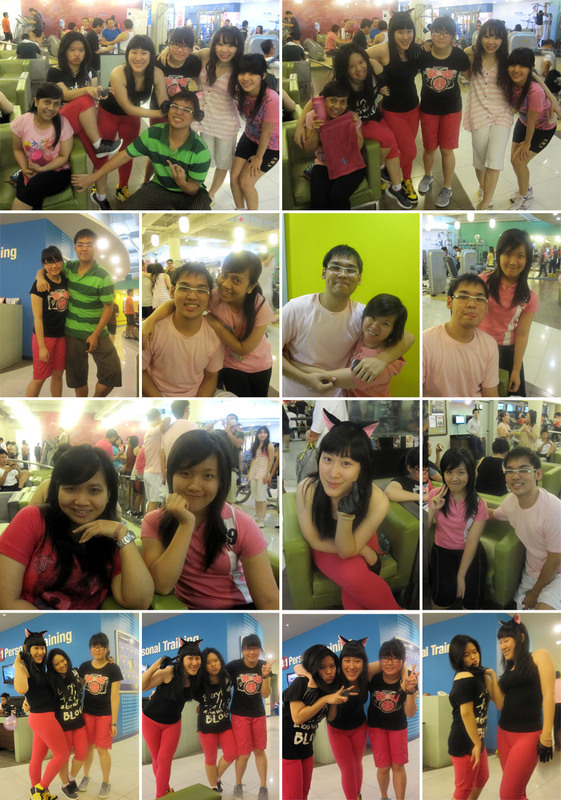 My friend, Evelyn Widjaja (Jun Ki) came out with a very cute costume, She got a Black Cat’s Ears Hairband, That’s CUTE !! I called her Catwoman. 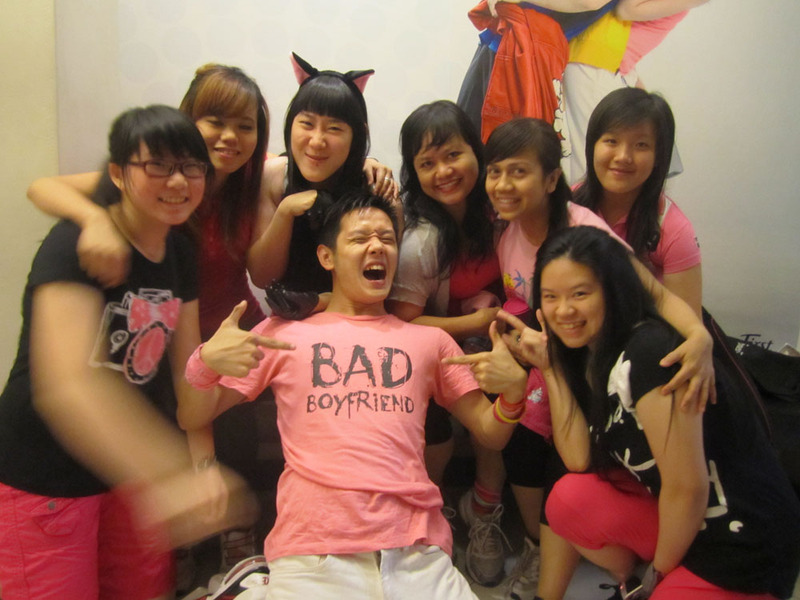 And Julius is a Ladies’ Man, All girl loves him ^_^ like James Bond. 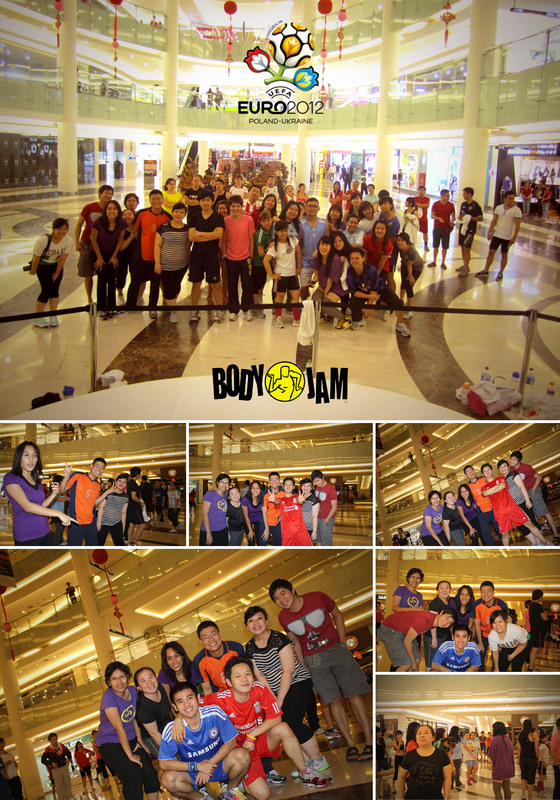 Bodyjam™ vs Sh’bam® Extended 90 minutes class. It will be start at 7.15 pm. Instructors who will be teach are Anthony, Andika and me. We have arranged a great track list to get crazy on the dance floor. We’re also wearing pink but coincidentally with the same style of color and design. Our outfits have words on it. Anthony is “KEEP LAUGHING :)”, Andika is “NO LIES JUST LOVE” and mine is “BAD BOYFRIEND” I think that’s cute! Now is 7.15 pm, LET START THE PARTAYYY !! We turn the music ON and let the members come in. It’s open house so we can see a lot of new faces in the class. It’s about 60 people !! WOW !! I opened the class with a short introduction then we start hit the floor with some Pop, Jungle and Hip Hop Bodyjam™ tracklist then continue with the fun part, The Sh’bam® with Andika that made us almost lose our breath. That’s just the first part! The second part was presented by Anthony with Bodyjam™ Latin & Jive mixed tracklist. The peak is Cha-Cha Heels track, a very massive cardio dance with Latin African style! That’s insane !! A very smooth tipsy feel recovery after the Cha-Cha Heels , we back again to Sh’bam part 2. Andika did a very good job presenting track 9 from Sh’bam® 6 “Who Run The World” , taking all the people facing the mirror and dance. They look exactly the same like Beyonce’s music video. The peak of Sh’bam® start with “Party Rock Anthem” , Andika asked who requested this song. It’s David (a member of FFPV)! I pulled him up to the stage and we dance together! That’s a fun part !! We’re all shufflin’ everywhere till the end. Finish! next track is Anthony, but too bad. He got a sprain in his ankle. So he need to stop for a while. Everyone’s worry about him. The show must go on, so I and Andika took over and present the last 2 remaining tracks. Yeay! Finally 90 minutes of party is over !! A lot of prizes and goodie bag from FFPV. 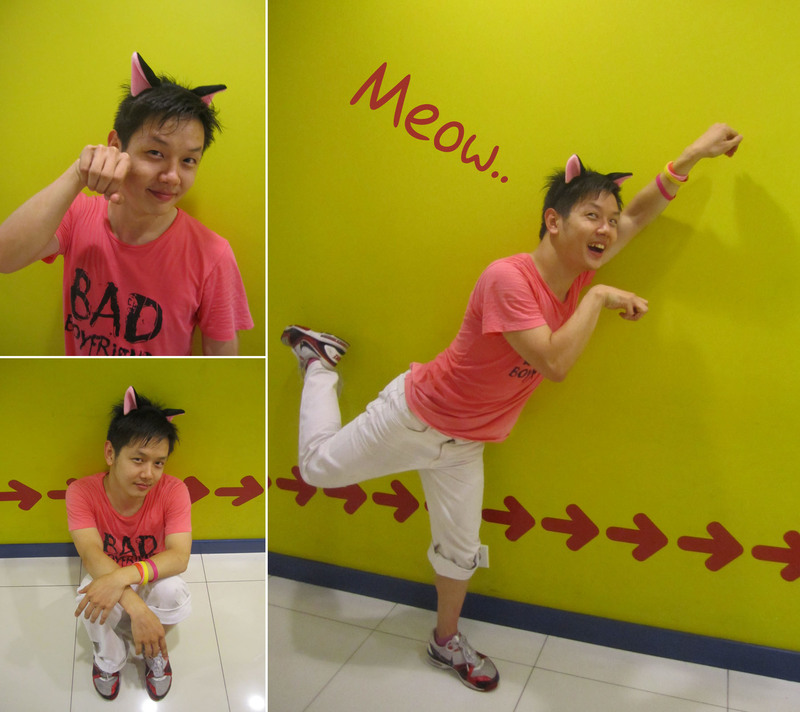 We gave Goodie bags for Evelyn Widjaja (Jun Ki) for her Best Costume: The Cat (meow! 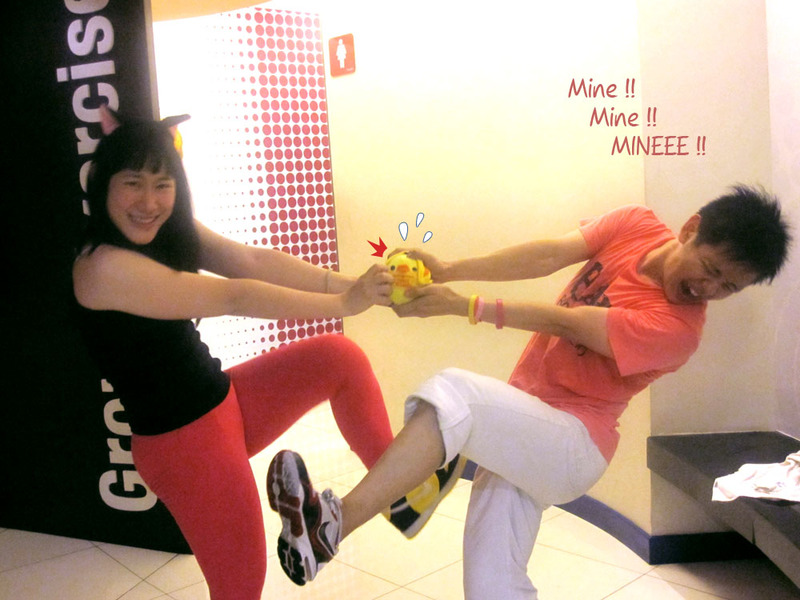 ); for a member who came far away from FF Grand Indonesia to FFPV just for joining the special class, Thanks for her appreciation (it’s a looooong way to go); For a New face member (I don’t know his name but I think he’s David’s friend) for his best performance and expression, David also received a goodie back for his energy dance on the stage. 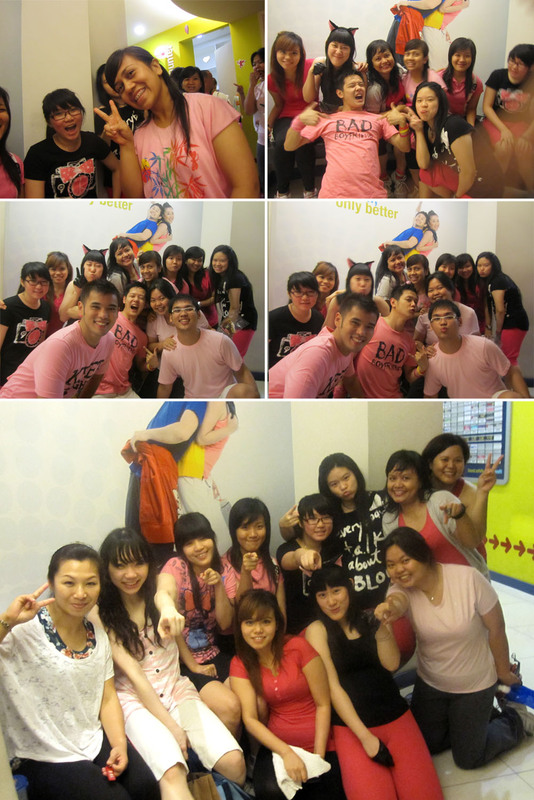 All the members got a special Valentine Chocolate Lollipop from Aurelia Lynda, The FFPV GX Manager. Everyone is happy. Then we’re having a photoshoot, a big family of Bodyjam™, Sh’bam® and Fitness First. Love you all !